HE SAID “MY SON, THE BATTLE IS BETWEEN TWO ‘WOLVES’ INSIDE US ALL. What a great lesson in life and used in my Real Estate Business. As a student at the Harris Real Estate Coaching University, I am constantly feed with ideas and positive ways to help my Lake Norman and Charlotte clients. Live by these words in life and in business and you will succeed. Content courtesy of the Harris Real Estate Coaching University! As of 11/15/15, there are still a lot of inventory with regard to waterfront homes on Lake Norman. 250 homes are listed for sale on Lake Norman as of today with prices ranging from the 200,000’s to the millions. If you are interested in Lake Living, there is still much to choose from. Of these 6 homes are foreclosure, short sales of estate sales, There is an estate in Denver for 1.7 million that is beautiful. We can help you find the waterfront home of your dreams if you need some assistance. We know the lake and can offer sound advice. It is still a great time to buy and sell. Interest rates are still low! Selling your Lake Norman home can be a very stressful endeavor. I laugh at those that feel Realtor’s just put a sign in the yard and wait for a buyer. In my many years of Real Estate, I can’t recall a time that this happened. Even the times we have gotten an offer in almost record time, the various aspects of negotiations and closings challenges make a Realtor’s job one of wearing many different hats. We live in a world where everyone wants to win(more on that later) and we are driven by visual stimulation. Successful listings of homes stand out online and are the one’s which have professional photos and Virtual Tours. This is why, we hire Tourfactory.com for all our listings. You will notice from the front page of featured listings, the photos and tours are awesome. Check out the Lake Norman Waterfront Virtual Tour of a home I listed. There are other aspects of selling your Lake Norman home that we also try to emphasize. The front of the home needs to be stellar. It is the first thing potential buyers see and can be a showing killer if the first thing they see is run down porches, hedges/buses, yard, shutters,siding (where applicable), and gutters. The home should be free of clutter and things the may distract potential buyers from seeing what you really have to offer. Obviously, if you reside in the home, you have to be able to live a normal life. You may even want to consult with someone that can help with home staging especially if you are not having any luck and the home is vacant. 1. It does not matter what Zillow says. Zillow does not enter your home and has no idea what our MLS says with regard to closing prices, upgrades in the home, seller concessions, neighborhood amenities etc. 2, It does not matter what the Tax value is. Tax value has a sole purpose of creating a way for the city and county to generate revenue. It has nothing to do with recent sales. Let us as Realtor’s show you reports of recent sales. This is what Realtor’s look at when they represent buyers and advise them on what is priced competitively. If you are too high, Realtor’s will tell their clients that you are not realistic and advise them to skip your home. Thinking of selling your home in the Lake Norman, Huntersville or Birkdale Area? Carolina Living has a unique proposition for you. Not only do we ensure professional and class representation with professional photos ,virtual tour and a new classy look and feel, we have a unique way of helping you negotiate with buyers. Our way is not something any other firm is willing to do and one that buyers do not even need to know is happening. You see we understand the mindset of buyers and have figured out a way to make all sides winners. If you are intrigued by how this might assist you in selling or just want to hear what we are talking about, please call Roby Robertson at 704 451 7051. They say a picture is worth a thousand words. Need we say more? 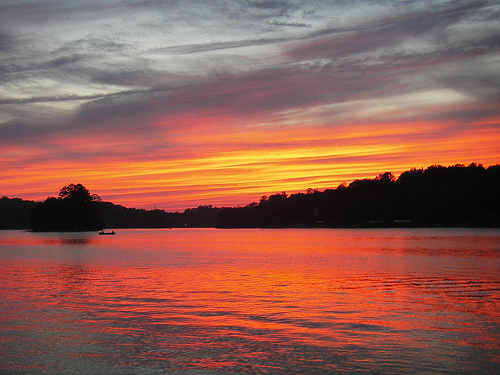 Lake Norman is a fantastic place to live and own real estate. You can live on the water, near the water with a deeded boat slip or just a few miles away with easy public access to the lake. Either way, spending the day or evening on the lake is fun and like being on vacation year round. Lake Norman Real Estate is picking up but there are still fantastic opportunities for whatever your needs may be. We have several websites allowing you to look for what you need and they are listed on this site. You can also visit Roby Robertson to search to your hearts content! 🙂 Come join us in an area that has it all! While not exactly Lake Norman, this home is close enough to get on the Lake quickly but far enough away to avoid all the traffic and congestion. Mount Ulla is a mere 15 minutes from downtown Mooresville and all the Mooresville area has to offer. If you love a little room the home at 220 Worthington offers 3.14 acres, 6 garage bay and office in the detached garage. The entire detached garage is heated and cooled and even comes with separate room created just for your motorcycle! Home has ALL the luxury upgrades like hardwood floors, granite counter tops and much more. Even the part of the home only the builder knows is upgraded. Add your security gated fenced yard and this is perfect for those loving their privacy. For those bargain hunting in the Lake Norman area, here are some statistics to ponder. There have been 132 homes sell in MLS area 13 (Lake Norman) that were designated as distressed sales. This is a great opportunity at The Point: Listed at 1,599,000 this home is in the pre-foreclosure process and will make someone a fantastic deal! Offered by Doris Nash with Ivestor Jackson Realty, this home is the real deal and is absolutely gorgeous. Great Opportunity! SHORT SALE – Quality Greg Helms Built Ranch with walkout lower lever. Master on main and 3 bedrooms down.3 fireplaces – huge screened upper terrace. On great open water with private pier. Home sits on .89 acres with great open water. The Point Lake and Golf Club is an awesome place to live and play. This home has around 5000 sq. ft., 4 bedrooms, 3.5 baths, Bar/Entertainment, Rec Room and quality workmanship galore!! Want to see it? Contact me and I will take you there. If you are interested in an Lake Norman Foreclosure or Lake Norman Short Sale we have some great choices for you. First we want to show you our pick community! Bay Crossing is a great community just north of Mooresville with great schools and convenient to shopping, I77 and so much more. If you check out the foreclosures and short sales at Bay Crossing be sure to take a close look at the home listed at 193 Bay Crossing Drive. As of 4/16/2012 it is listed for 400,000. However it was listed in 2009 for 700,000! WOW! Tax records show the home sold for 455,000 in 2006. This home could be a huge deal for someone. Do you believe. Instant Equity with all the upgrades! Contact me and lets go take a look!